Solar control window film is an amazing product packed with many consumer benefits such as solar heat control, lower energy costs, improved comfort and fade reduction. 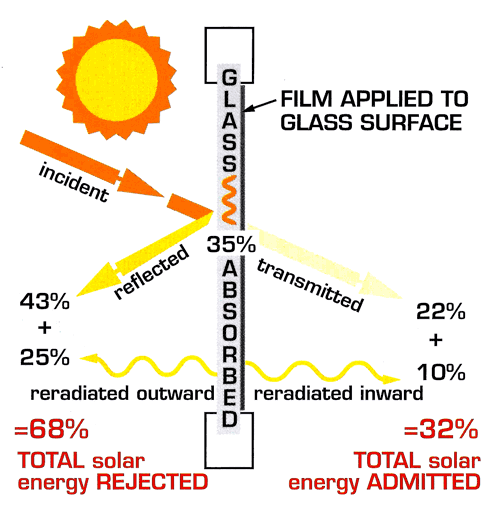 Solar films reduce the amount of visible light being transmitted through glass thereby reducing glare on their TV and computer screens. Many of our customers request solar window film just for the “daytime privacy” benefit, especially for their front of the house rooms. Solar control films can perform the same function as both the factory tinted and the reflective types of glass. Window films will often offer a greater variety of shades, colour and performance levels. All window films are designed to survive the harsh Australian climate with scratch resistant coatings for protection and metallic layers for colour stability.